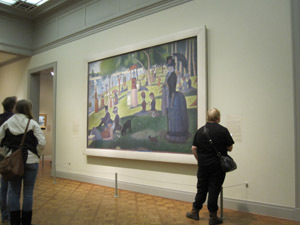 Alice and I recently took a spur-of-the-moment trip to Chicago, mostly to visit the Chicago Institute of Art. We left home early Wednesday morning, arrived at the hotel around 1:00 pm, got rid of the car, got checked in, and hurried over the three blocks to the institute. We spent several hours wandering randomly through the rooms of this magnificent place. After a quick supper, we made our way back to the hotel where we collapsed after the long drive and so much sensory input. The next day, Thursday, is a special day at the museum. They are open later than normal; until 8:00 pm instead of the normal 5:00 pm. We arrived just as they were opening, and stayed until they announced that they’d be closing. This day we got a better feel for where things were, and were able to start choosing places we wanted to go, and often finding them without too much help from the museum staff. Near the end of this long but exhilarating day, we decided to make a stop in the museum gift shop. After wandering there for a half hour, we paid for our purchases and left so I could use the bathroom. It was when I left the bathroom that the mystery took shape that was to consume the end of our visit to the art institute. I need to make you aware of two of my idiosyncrasies before I tell you about the mystery. First, I have very good near vision. Although I wear bifocals, I can read much better without my glasses than I can through my glasses. I am forever taking my glasses off and laying them down. Second, I have difficulty — how to say this delicately — evacuating my bowels, unless I am reading something. OK, I walked out of the bathroom at the Chicago Institute of Art, looked around, and noticed my glasses were not on my face. I quickly checked my pockets, and they were not there. (I often stick them in my pocket when I’m reading without them.) I walked back into the bathroom, back into my old stall, and looked everywhere. No glasses. I looked into that small porcelain pond, judged the opening, and became convinced that my glasses could indeed have been swallowed into the Chicago sewer system. I *need* my glasses to drive, changing the 8 hours on the roads back home from routine to difficult. I walked out of there, found Alice, and asked her if she’d noticed whether I had my glasses on when I came out of the gift shop. She said she couldn’t remember for sure. We walked back to the shop and asked the customer service people of any glasses had been turned in. Nope. By this point my mind was going into outside-the-box mode. Clearly, all the rational solutions to this problem had been tried and found useless. I had a limited number of pockets, all of which had been checked and rechecked. The bathroom stall was of limited size, and contained only a few places where glasses could hide. These places had been checked too. I visited the stall next door, and found no evidence that dropped glasses had slipped under the partition. In desperation, I went back to my former stall, sat back down on the seat with my pants in defecation mode. I stared ahead, thinking outside the box as much as I could. What if I had absentmindedly placed my glasses on the cloth shelf made my my pants. Where could they go if I’d just gotten up without putting them back on? I felt down to the place where my pant leg joined up with the top of the boot on my left foot. A delicious glasses-shaped bulge presented itself to my feel. Glasses came out, came onto my head, the world came into focus, and I strode out to face my wife, whose first words would assuredly be, “this will make a good story.” I think she was right. This entry was posted on Saturday, December 20th, 2014 at 7:23 pm and is filed under Uncategorized. You can follow any responses to this entry through the RSS 2.0 feed. You can leave a response, or trackback from your own site. Thanks for the comment Dina. I must not have been around when you lost your glasses that time. At least with the outhouses we had at the lake for so many years, you had a chance to recover your loss if you could stomach it. With modern plumbing, once it is flushed, it is game over. “A delicious glasses-shaped bulge presented itself to my feel.” PRICELESS. Thanks Randy. Delicious it was!